To buy health insurance from Health Insurance Marketplace you have to enroll during the open enrollment period. Health Insurance Marketplaces have been created as per Affordable Care Act a.k.a Obamacare. These marketplaces will be administered by either the federal government or the state government. Private health insurance companies like United Healthcare will sell insurance in these marketplaces. Open enrollment period for calendar year 2014 will start on October 1, 2014. Depending on your legal state of domicile you should visit either healthcare.gov or website of your state’s health insurance marketplace. Then you need to follow the enrollment process. Check this blog post to see where you should enroll. Open enrollment period for 2015 starts on October 15, 2014 and ends on December 7, 2014. Open enrollment period for 2016 starts on October 15, 2015 and ends on December 7, 2015, and so on. Is it Difficult to Enroll? The enrollment process is not difficult at all. Infact the entire process of getting health insurance through the marketplace is completed in four steps. These four steps are. Set up an account. While setting up an account you just need to provide your name, address, and email address. Fill online application form. You provide detailed information including family size, household income, current health insurance coverage, etc. Based on this information the marketplace website finds the plans that suit your requirements. Once you have a list of recommended plans you can compare them side by side on a number of parameters. The marketplace will also tell you if you qualify for free or low cost Medicaid coverage. Once you have zeroed on to a suitable plan you can enroll online. Anyone who is interested in buying health insurance from the marketplace should enroll. From January 1, 2014 every American must have a health insurance plan or pay a penalty. Health Insurance Marketplaces will sell qualified health insurance plans to individuals who cannot afford or are denied traditional insurance plans. Anyone can enroll but only those who qualify will get the benefit of lower (or zero) monthly insurance, lower out of pocket expenses. You should enroll even if you are covered or are not planning to buy from the health insurance marketplace. After enrolling you can use the marketplace tools to compare insurance plan. You can check if you are eligible for lower monthly premium. The marketplace website also tells if you qualify for a government aided program like Medicaid. 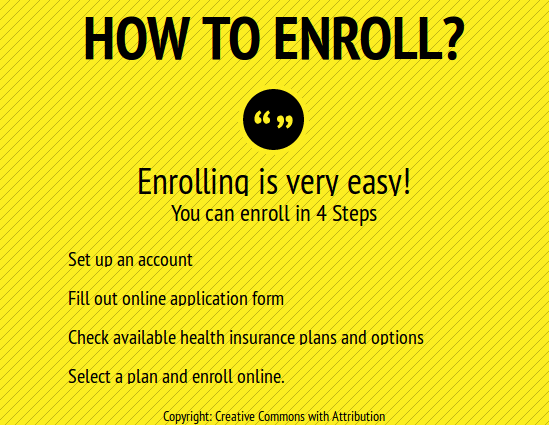 What if One is Unable to Enroll During Open Enrollment? If someone is not able to enroll during the open enrollment period then she can apply for enrollment during special enrollment period. Only those individuals who could not apply during open enrollment due to special circumstances like divorce, loss of employment etc are eligible to apply during the special enrollment period. What if One Does Not Enroll? An individual can choose not to enroll. But then that person will not be able to use the marketplace to buy insurance or even compare plans. As per Obamacare one must have health insurance in 2014 or else pay a fine. If you are not enrolling the you should be covered in a health insurance plan or be willing to buy one from the open market. Health Insurance Help – How to Find It? Is retirement before 65 with employer provided health insurance lost an event that allows enrollment in exchange as a special enrollment period? Hi Dave. Sorry for he late reply. I had to take an unplanned bread during the week. Great question. To be honest I do not know the answer. But what can be done is register at the exchange. Buying health insurance is not compulsory after registration but it allows to buy the cover if required. I will do some research and precisely answer your question within 2-3 days.